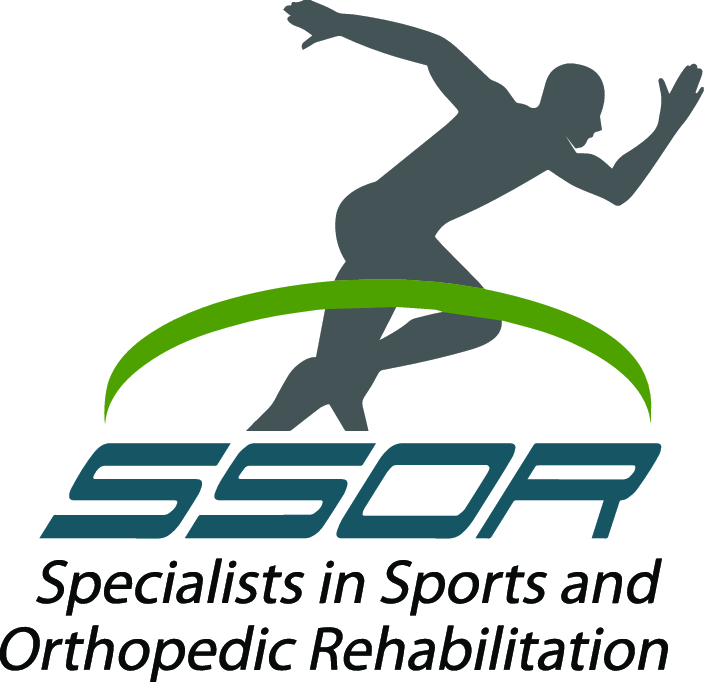 Note: This is part 2 of a blog from a collaborative effort between Dr. Michael McCabe of Carondelet Orthopaedics & SSOR. Dr. McCabe was kind enough to share his expertise on the topic in part 1, and in part 2, he and Dan Lorenz discuss treatment and rehab implications of posterior shoulder instability. Thanks so much Dr. McCabe! For more information on Dr. McCabe, go to the Carondelet Orthopaedics website or to learn more about Dr. McCabe here. If you have chronic activity-related posterior shoulder pain or suspect that you may have posterior shoulder instability, the first step is to obtain an accurate diagnosis, which can usually be made without an MRI. An orthopedic surgeon with fellowship training in sports medicine is the specialist most likely to be familiar with the diagnosis and treatment of this condition. A trial of physical therapy is the appropriate first line of treatment after diagnosis as some cases can be successfully treated without surgery under the supervision of a skilled therapist familiar with the condition. 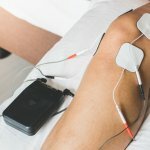 If this fails, then arthroscopic surgery offers the best opportunity for symptom relief provided the patient remains dedicated to a structured post-operative physical therapy regimen. Return to full activities is typically allowed 4-6 months after surgery depending on the individual, and success rates are usually excellent. In cases of posterior shoulder instability, a course of conservative treatment up to 6 weeks is appropriate to see if strength and function can be restored. This may be longer in contact athletes however. Desired activity level often dictates who responds to treatment as well as who will require surgery. The decision to have surgery should be a collaborative effort between you the patient, the orthopedic surgeon, and the physical therapist. 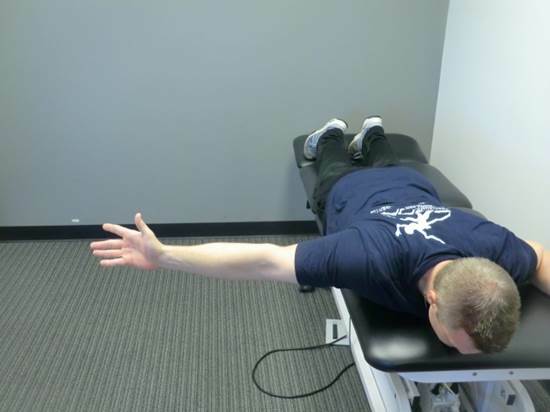 With posterior shoulder instability, there are a few central tenets of rehabilitation. First of all, the posterior capsule is the thinnest and weakest part of the shoulder capsule (Bradley et al, AJSM 2006). This part of the capsule is strained in the position of flexion, adduction, and internal rotation. Therefore, these positions at end-ranges should not be done in the initial phases of rehabilitation to allow healing to occur. So, things like reaching behind the back, bench press, overhead weightlifting, or swinging a baseball bat/tennis racket/golf club are just a few things to avoid in the early stages of recovery with posterior shoulder instability. Another important aspect of posterior shoulder instability is targeted strengthening of the posterior rotator cuff and posterior deltoid. The infraspinatus, teres minor, and posterior deltoid will all help to prevent posterior translation of the humeral head during functional and/or athletic activities. 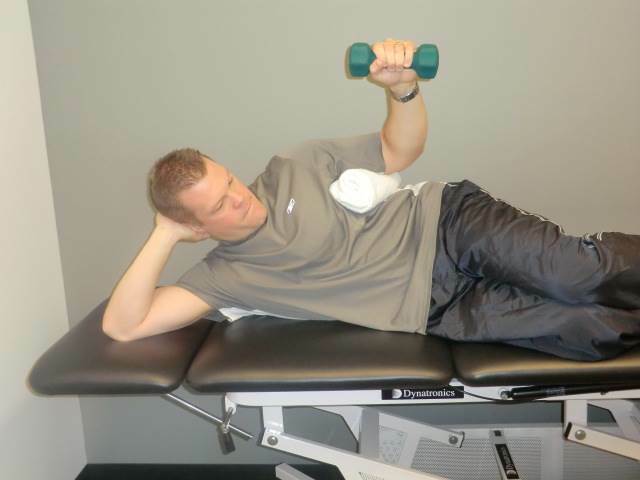 A couple of exercises specific to posterior deltoid/posterior rotator cuff are pictured below. Prone horizontal abduction with external rotation to target the posterior rotator cuff and deltoid. Finally, stabilization exercises are an integral part of rehabilitation for either conservative management or post-operative rehabilitation. Those with generalized ligamentous laxity are at risk for developing posterior instability (McInttyre et al, Phys Ther Sport 2016). Therefore, stabilization exercises focusing on neuromuscular control of the joint are paramount in the rehabilitation process. Rhythmic stabilization drills and eventually stabilization drills in non-weight bearing with a physical therapist/athletic trainer and in the weight-bearing (i.e. push up position) should be done once proper muscular strength is achieved. The patient should start in “quadruped” or on “all fours” and then progress to standing, and then eventually in the push-op position. A patient should be able to tolerate standard push -ups without pain or instability. Explosive activities, like plyometric push-ups, are appropriate for contact athletes as well (wrestling, football, rugby, etc). 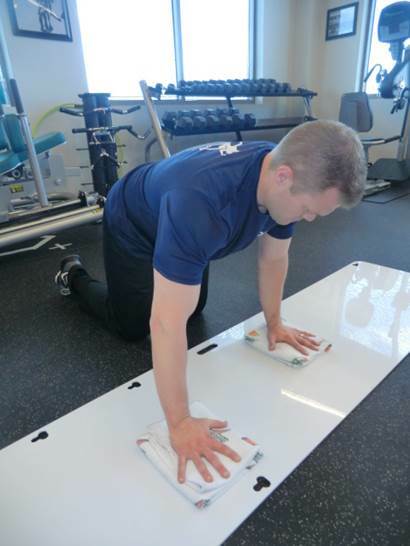 Stabilization exercises using a slideboard or on wood/laminate flooring. This should only be done once the patient has pain-free range of motion (ROM) and proper strength, typically about 4-6 weeks after injury. The patient should “round” out their shoulders and perform movements like letters of the alphabet while maintaining proper shoulder position. Discharge criteria/return to sport is multi-factorial. For the most part, return to sports activities is anywhere from 4-6 months depending on the sport and level of activity. The patient should have pain-free active range of motion and have no pain with activities of daily living (ADL’s). Strength testing of the rotator cuff should be normal and painless. For overhead athletes, they should be tested at the “90/90 position” as well. They should also pass a series of functional tests including but not limited to the Closed Kinetic Chain Upper Extremity Test, the Upper Extremity Y Balance Test, and the Seated Medicine Ball Throw. Finally, shoulder outcome scores like the Penn Shoulder Score, Upper Extremity Functional Index, the UCLA Shoulder Score, and the American Society of Shoulder and Elbow Surgeons (ASES) Score might be some to use. It would be a privilege to partner with you in either the conservative treatment or post-operative care for your shoulder instability. We have locations in Overland Park and Prairie Village to serve you.